Russia shows off its new Sukhoi T-50 Stealth Fighter aircraft. China recently showed off theirs. 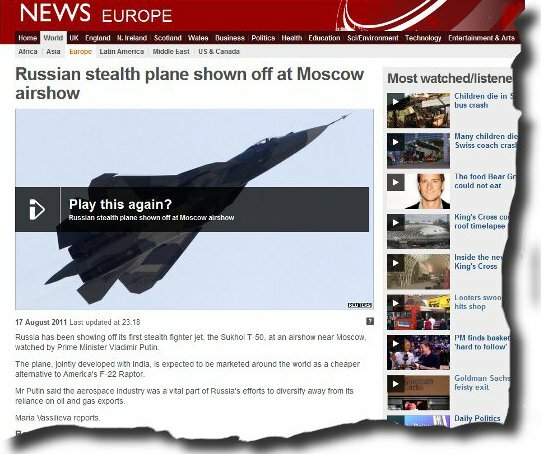 If you didn’t see it, errm, it is a Stealth Aircraft. So there are three players now with Stealth Aircraft. America, Russia and China. In the game of Chess, America is going for Oil and Poppies, China has gone for Rare Earth and Steel, Russia is looking for other markets outside of Gas and Oil, re-entering the aviation field. GOD = Guns Oil and Drugs.